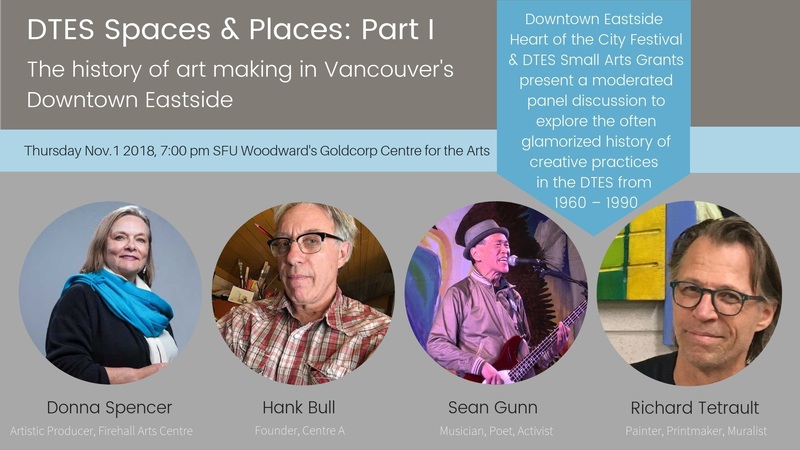 This panel, moderated by Terry Hunter (Artistic Producer, Heart of the City Festival), will explore the often glamorized history of artmaking in Vancouver’s Downtown Eastside (DTES) from 1960 – 1990. This program is a co-presentation of the Downtown Eastside Heart of the City Festival and the DTES Small Arts Grant Program and is generously supported by SFU Woodward’s Cultural Programs Department. Please note this is the first of three discussions about creative spaces + places in the Downtown Eastside (DTES). Donna Spencer is a founding director of the Firehall Theatre Society in Vancouver and currently the Artistic Producer. An advocate of cultural understanding and awareness of diversity, she established BC's first culturally diverse theatre company and established an apprenticeship training program for artists from diverse cultural backgrounds. She enthusiastically supports non-traditional casting. She received a Jessie for Outstanding Direction in 1999 for Reading Hebron and was awarded a Jessie for Multi-Cultural Innovation in Theatre. She has also received the City of Vancouver's Cultural Harmony Award for her dedication and long-term commitment to cultural awareness in Vancouver. Spencer has developed three original scripts collectively with teenagers, dealing with racism, acceptance of immigrants, peer pressure and suicide. As the Artistic Producer of the Dancing On The Edge Festival and the Firehall Dance Series, she has brought contemporary dance from a variety of cultures to Vancouver stages.She is the founding chairperson of the Vancouver Cultural Alliance and a founding member of both the Vancouver Professional Theatre Alliance and the Women in View Festival. She also served on the BC Arts Board and received the YWCA Women of Distinction Award for Arts & Culture. Hank Bull was born in 1949 in Calgary and grew up in Ontario and Nova Scotia. After working on the railroad, picking tobacco, playing in bands and backpacking around Europe, he moved to Vancouver in 1973 and joined the Western Front. In those days he lived on Alexander Street, hosting a weekly show on Co-op Radio with Patrick Radio. A year spent researching traditional and contemporary art in Asia, Africa and Europe led him to start producing international artist exchange projects. In 1999 he co-founded Centre A, the Vancouver International Centre for Contemporary Asian Art, which was located right across from Pigeon Park in the BC Electric Building. An exhibition survey, “Hank Bull: Connexion,” toured to five cities across Canada in 2015-17. Hank still lives at the Western Front and sits on the board of the Vancouver Art Gallery. He has just returned from Toronto where he presented a shadow puppet performance. Sean Gunn is a fourth-generation Chinese Canadian, a community activist, a poet, and a musician. He has been an active participant in Asian Canadian political and cultural activities since the early 1970s, serving as a member of the board of directors of the Vancouver Chinese Benevolent Association and a volunteer for the Powell Street Festival. His poetry and lyrics have appeared in Asian Canadian anthologies such as Inalienable Rice, Many Mouthed Birds, Millennium Messages, and Swallowing Clouds. He has performed a musician in documentary films such as Moving the Mountain and In the Shadow of Gold Mountain. His compositions can be heard on recordings such as “Rising” and “Hockey Night in Chinatown” by a band named Number One Sun, and “Chinatown Boogie” by a band named the Running Dog Lackeys. I am a Vancouver-based painter, printmaker and muralist, focusing both on collaborative projects as well as my studio practice. I have taken part in projects and exhibitions in more than 80 venues in Canada as well as internationally, and my work has appeared in numerous publications, theatre works, films, graphic projects and dance. The process of democratization of the arts is central to my passion for reintegrating art, labour and community, resulting in a history of significant projects that underscore this. Although murals are frequently my medium of choice due to its adaptable and affordable nature, I have also worked on large‐scale pieces that incorporate a broad range of media; ceramic tile, concrete and wood relief, banners, printmaking, photo‐transfer, text and mixed media. I have worked with writers, including collaborations with downtown eastside poet Bud Osborn. Most recently, I coordinated several large-scale print projects incorporating a steamroller as a press in a public setting. I have taught youth, teens and adults in printmaking, murals and multi-media, and my workshops push boundaries by encouraging an openness to experimentation in a range of media. I have been awarded grants and residencies including a long-term residency in Germany in 1993, travel grants for exhibits in Thailand and Ontario, and numerous grants for public projects throughout Canada. In 2008, I was a recipient of The City of Vancouver Mayor’s Arts Award, and in 2013, The Queen’s Diamond Jubilee Medal.